Mankind, unlike all animal species, is capable of perpetual growth and progress. Realizing this potential, however, requires that we increase our power in and over nature, over time. Such increase does not happen at a steady pace and by continuation of one level of technologies and practices, but by revolutions—leaps upward—in the productive powers of each individual, which result from the introduction of new creative discoveries into mankind’s applied practice. In this way, man creates his own future and evolves upward through discoveries of higher and more powerful principles than those he wielded before. Compared to mankind of the middle ages, or of the 18th century, we as a species are a mighty geological force, with powers to change nature, and to sustain human life in greater numbers and to broader geographical extent, than ever existed before. It is thus the role of economic policy to encourage and enable such crucial discoveries, and their application to our work and life. The vital and unique role of the creative human mind just referenced is the principle underlying LaRouche’s call for a “Fusion-Driver Crash Program” as the fourth of his “Four Cardinal Laws to Save the USA Now.” We must craft our economic program to effect the necessary next steps to be taken by mankind, in conjunction with a program for the colonization of nearby space. With such a commitment for the next several decades, we will re-assert our self-advancement towards a more powerful state of humanity. Throughout human history, our discoveries have put ever-higher forms of “fire” into our hands—from wood fire, charcoal, coal, and coke; to petrochemicals and natural gas; to the fire of the atomic nucleus—which we use to transform nature around us, and to expand our reach both on and off the Earth. This succession of categories of fire has given us the means to cook food, melt and transform metals, invent new chemicals, travel faster than sound, reshape mountains, redirect rivers, create new elements of the periodic table, and send rockets to other planets. The next step in our mastery of principles of nature lies in full mastery of the powers of the atomic nucleus: controlled nuclear fusion. Nuclear fission reactions, which have been under our control for many decades, release energy when a heavy nucleus (such as uranium) is split apart. 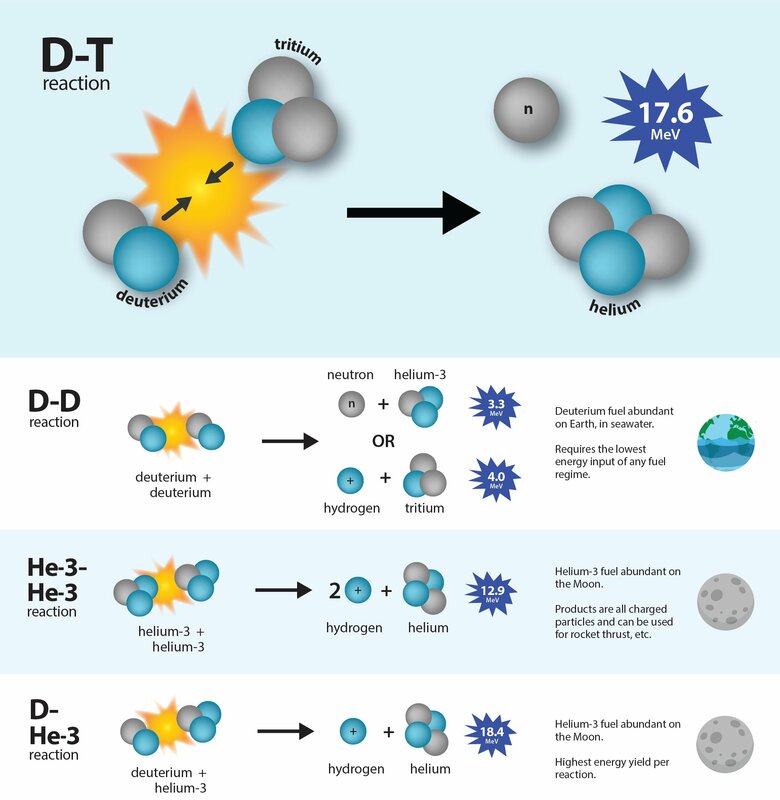 Fusion reactions unite two light nuclei (such as hydrogen and helium), releasing an order of magnitude more energy (per fuel mass) than fission reactions. However, making fusion happen is not simply “fission backwards,” and it has challenged our basic assumptions about the behavior of matter and energy. The potentials of controlled fusion are enormous. 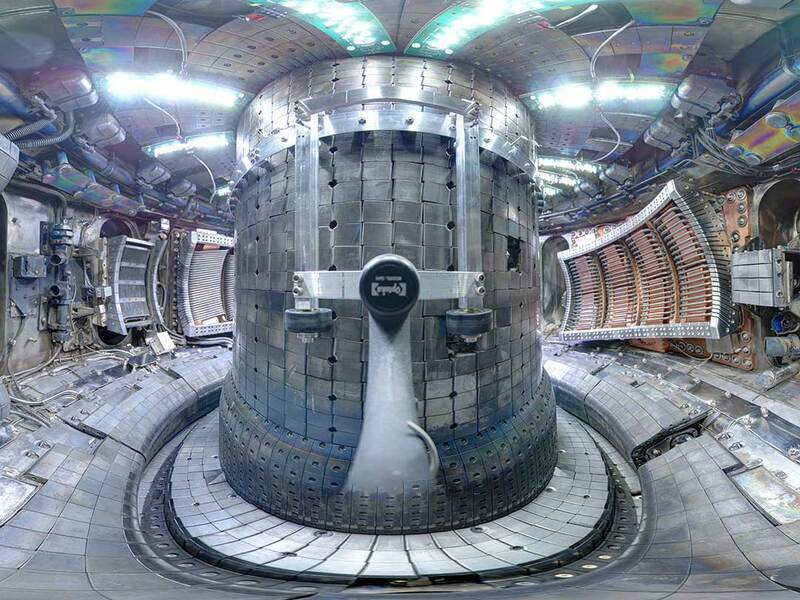 While the temperature inside a fission reactor can range from 300-1000°C, temperatures inside fusion reactors are in the tens of millions, to hundreds of millions of degrees. This means that we are interacting with matter in an entirely new way, since any material is vaporized at such high temperatures, and becomes a superheated charged gas, called a plasma. 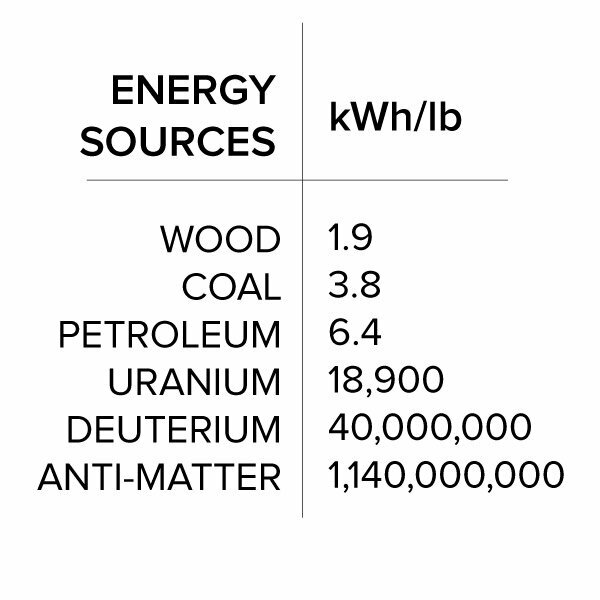 The power of fusion is seen both in the sheer magnitude of power produced, and also in unique qualitative properties of high temperature plasmas. Inside a tokamak—one type of fusion machine—when fusion occurs, energy is released in the form of electromagnetic radiation and charged particles. The heat and charged particles created can be used to produce abundant electricity very cheaply, and the full spectrum of products of fusion reactions have other applications in industry, medicine, mining, and other sectors of the economy. The resulting increase in the productivity of the labor force will support increased lifespans, population density and quality of life, both on and off the planet. The advancements of a fusion economy are at our fingertips, and can be brought about by a firm commitment to an international crash program effort, within a new paradigm of international cooperation. Applying the immense power of controlled fusion on Earth will transform our species relationship to nature in an almost unimaginable way, but its full potential is extraterrestrial. Fission and fusion power will allow us to live and work in other places in the Solar System, and to transform them, in a way that is impossible with chemical power alone. The process will begin on the Moon, our nearest planetary neighbor—and a rich depot for fusion fuel! For billions of years, the Sun has been depositing helium-3, an isotope of helium, via the solar wind onto the surface of the Moon, where it is held within the upper layers of the lunar soil. Helium-3 is very rare on Earth, but estimates are that there are 1 million tons of helium-3 on the Moon, which would be enough to power civilization on Earth at current levels of consumption for millions of years. Establishing mankind’s permanent presence in outer space begins with colonizing the Moon. This achievement will be accomplished in a series steps building up the knowledge and physical capabilities needed to live an unprecedented distance from Earth’s surface. Pictured here is an advanced point in a staged program of lunar settlement. Prior to this stage, the Moon must be surveyed extensively, mapping the location of minerals to be used later in construction on the Moon. A lunar space station is built to facilitate trips to the surface and to develop experience living in close proximity to the Moon, with frequent trips between Earth and lunar orbit. Processing centers to create building materials are built in lunar orbit and on the surface, along with temporary housing. A radio-astronomy array is set up to observe the heavens. Eventually, a permanent habitat, the first lunar colony, is constructed. Helium-3 is an ideal fusion fuel. Fusion of deuterium and helium-3 releases more energy than any other fusion fuel regime (see the above figure), and unlike other fuel combinations, the products of the reaction are almost entirely charged particles—which can be controlled with a magnetic field. This means that they can be used to produce electricity directly and efficiently1Electricity can be generated directly from the charged plasma via magnetohydrodynamics (MHD), rather than using a steam cycle (used in most power plants today). With MHD, we could potentially double the amount of electric power generated from every unit of fuel, over what’s possible with steam and turbines., and also as thrust in fusion rockets. With nuclear power we can maintain our work and industries through the 2-week-long lunar nights. Nuclear rockets can power flight to distant bodies like Mars in weeks, as opposed to months. With fusion power, we will upshift our species to one which can extend and maintain its existence throughout the inner solar system, and perhaps beyond, and begin to fulfill our role as a creature from Earth with an extraterrestrial imperative. 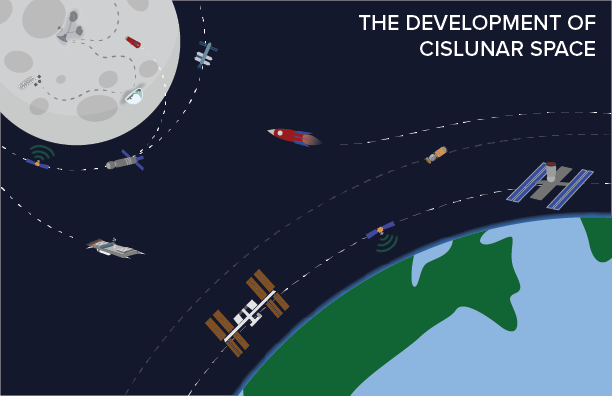 We are looking at the immediate potential for international cooperation in the exploration and development of the Moon and the cosmic environment within the Moon's orbit (cislunar space). This could get going right away, and would produce amazing results. Such a program would require new discoveries in the domain of high-energy physics, biology in the space environment, fission and fusion power, and related fields. In this first stage of development, we will establish the technologies, resources and capabilities needed to expand beyond, to places such as Mars. China has taken leadership on lunar missions in the recent decade, and has invited cooperation from all other nations—including the U.S. In 2017, China will return a lunar sample to Earth for the first time in 41 years, and in 2018, they will place a lander and rover on the far side of the Moon. Mankind has never landed anything—robotic or human—on the lunar far side, yet that location promises to tell us more about the history of the development of our Solar system with its unique geology than anything we can access on Earth; and by setting up a very low frequency radio astronomy observatory there, it will give us a glimpse into features of the Solar system, Milky Way galaxy and far distant galaxies which are simply impossible to see from Earth or Earth orbit. The spinoff technologies generated by expanding the arena of human dominion to, first, cislunar space, then within the orbit of Mars, and then the entire heliosphere, have the ability to lift every nation out of poverty, cure every disease, feed every child, and render the tools and causes of war obsolete. For the reason, leaving the Earth will drive the greatest upshift in civilization on Earth in human history. The commitment to space exploration will be the embodiment of the new paradigm, and must be based on the defense of the creative identity of the human mind. Human beings are a space-faring species, not meant to be confined to Earth: a species with a mission to discover and come to understand who we are as mankind in the Universe. We must bring about a unified human mission that establishes a completely new view of the Solar System, defined not by the compartmentalization of space, but by a unified galactic system.